Dog foods come in different shapes and forms: dry, wet, canned, dehydrated, freeze-dried, human-grade, organic, grain-free, low fat, sensitive formula, and many more. It is hard to figure out which dog food brands to trust, and which to stay away from. 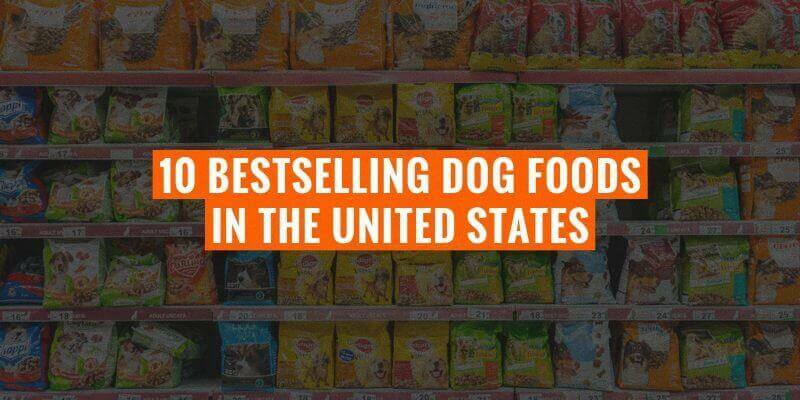 This article reviews the top 10 bestselling dog foods in the United States. Granted, it is not because a lot of people buy a specific dog food that it is synonymous with quality. The brand may execute a wonderful great marketing campaign. Or, the dog food may be sold with a very low and enticing pricing strategy. However, what is great when a dog food is on a bestselling list, is that you know thousands of dog owners serve it daily and so far, everything is ok. The pet food industry is constantly changing which makes it hard for us, dog owners, to find a brand, a range, and stick with it for years. There is that FOMO — Fear of Missing Out. We always see new something new and trendy popping out, with yet new incredible nutritional benefits. Read up these reviews of the bestselling dog foods, and try some out and see how does your dog react to them. A protein-rich dry dog food that provides optimum nutrition for strong bones and muscles. This dog food has been rated as #1 on Amazon. Made and operated in the US in a family owned business, Taste of the Wild foods brings a complete, well-rounded meal alternative for health and well-being. Packed with rich anti-oxidants, this protein booster is created with safety protocols in mind backed by scientific research and data. Ideal for adult dogs, the ingredients have origins traced back to the most trustable sources offering a grain-free blend and is considered a true superfood. High Prairie contains natural ingredients including real meat, roasted bison, essential amino-acids, and added fruits and vegetables that give the nutrients an added boost. The proprietary probiotics (80 million CFU/LB) and fatty acids assist in smooth digestion and give your dog a shiny coat. Users appreciate the immune support that Taste of the Wild kibble offers. Then, due to this blend being free of fillers, wheat, corn, colors, and preservatives, dog owners are assured that their dogs are receiving one of the healthiest foods on the market. With one package weighing in at 30 lbs., reviewers rave saying the price is proportionate to the quantity received. 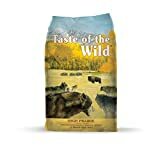 Some buyers claim that Taste of the Wild is better than the Blue Buffalo in regards to ingredients. Dog owners have noted that their older aged dogs show a higher increase in energy levels after consuming Taste of the Wild dog foods. — HUMAN-GRADE Dog Food… Yep! 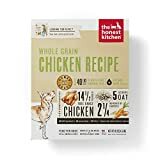 The Honest Kitchen has inspired many dog owners with its rich, dehydrated dog food because of it organic nature. The Honest Kitchen has created the first of its kind in supplying organic human grade food with 100% ingredients. Because of this, this whole grain, chicken recipe is specially designed with quality and safety in mind. Made with free-range chicken, this dry food has been dehydrated that provides optimum nutrition for dogs of all ages and sizes. It’s all natural and contains no preservatives, GMO ingredients, or by-products. Made in the US, one package contains 14 ½ lbs. of product and all you need to do is add some water to it and it’s ready to eat. The Honest Kitchen Human-Grade blend has been tested by professionals to meet the standards of food for human consumption. So yes, even humans can eat this dog food. The method used in dehydrating this food has made it easier to digest and highly concentrated by removing all the water for compactness and nutrition density. Buyers love this brand claiming it deserves more than 5 stars for ultimate quality and they say that it is well worth the little extra effort put in for prepping. However, not all users particularly like the texture and just be aware that it does contain sodium selenite, as one user had warned. — Absolute Best Freeze-Dried Dog Food! Stella & Chewy’s has made it to the top of the list for being the #1 bestselling freeze-dried dog food on today’s market. 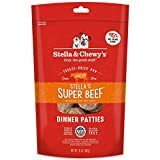 Appropriately labeled “Only the Good Stuff!”, these beef dinner patties made for your dog supply a whopping 95% grass-fed beef along with bones, organs and organic veggies and fruits for maximum nutrition and strength. This organic blend, made in the US, has been enhanced with antioxidants and probiotics. Minimally processed, it contains no added hormones or antibiotics. Pets enjoy the flavor and buyers can appreciate the fact that this dog food contains no gluten or grains for dogs who suffer from food sensitivities. This brand even supports vibrant coat and skin, as well as healthy gums and teeth. Users like how the patties are versatile such as, they can be crumbled, mixed, or soaked in water. One buyer, however, complained of finding bone shards in the bag so it may only have been a bad batch. Another highly-respected dry food formula specially made for adult dogs, Blue Life Protection offers a delicious and satisfying blend. The Blue Life kibble is made with hearty meats that add flavor and protein to your dog’s balanced diet. Made from deboned chicken and brown rice, this blend is free from protein by-products, soy, corn, or wheat. Additionally, no artificial colors or preservatives are found in this product. For a nutritional punch, this protection formula is packed with wholesome grains, fruits, as well as vegetables. Blue Life offers a unique brand that appeals to any dog breed, size, and condition. Your dog’s cognition and mobility are greatly enhanced with its blend of DHA, glucosamine, and chondroitin. These are especially helpful for aged dogs, or breeds of larger size prone to arthritis and musculoskeletal problems. Blue Life is specially formulated and designed for your dog’s health and wellness. Made in the U.S. and offering 22% crude protein, it comes packed with the essential amino acids and vitamins including B-12, B6, beta-carotene, and vitamin E. Buyers say their dog’s coats have come back to life with more shine and luster and this food has greatly optimized their pet’s energy. This brand has helped alleviate and even prevent stomach issues such as diarrhea and vomiting. On the downside though, few reviewers have reported increased thirst and runny stools after use. This nutritiously delicious, and super premium, dry dog food is made with real, U.S. farm-raised chicken which counts as it’s #1 ingredient. Containing 26% crude protein, this is a natural food that provides wholesome chelated minerals and is free of by-product meals, wheat, gluten, and fillers. Natural prebiotics is added to sustain a healthy digestive flow and promote the beneficial gut bacteria. The peas, carrots, and beet pulp provide the essential fiber for your dog’s diet, while the brown rice gives him the carbohydrates necessary for energy support. The fat from the chicken adds essential omega 3 and 6 fatty acids for optimum skin and coat health. Rachael Ray kibbles provide a sensible eating plan that helps your dog transition from his old food to relying solely on Nutrish Natural. Users rave how this dog food has aided in their dog’s digestive health and treated their loose stools. One user advises waiting at least 3 months before seeing results as some of its benefits may take time to develop, however, have already seen great improvements within 5 to 6 weeks. On a side note, however, one buyer believes that a relatively bad batch of Nutrish Natural was distributed as it seemed to provoke diarrhea in dogs, even when the same batch had been given to other dogs with similar results. With this ideal dry food blend, Purina offers a full blend that both aids in digestion as well as offering the protein your dog needs for maximum health. This pro, special blend offers real chicken meat as it’s #1 ingredient. Alongside, the rice offers your dog his daily carbohydrate intake which aids in digestion and provides sustainable energy throughout the day. What makes this Purina blend a top source in the market is its prebiotic fiber which is sourced from natural wheat bran. The prebiotics assists in a smoother digestion and promotes intestinal health. Purina’s nutrition is backed by research and expertise as well as years of experience. It’s also the choice of dog food for competitors and holds high praise in the Westminster Kennel Club Dog Shows. Dogs who are normally picky eaters have no problem accepting this wonderous treat blend and find it palatable. Recommended by vets, the Purina Pro Plan is easily accepted by dogs of all types and sizes while some say it is easy to chew. It’s definitely praised by many buyers saying it’s their #1 pick and favorite dry dog food of all time. However, some users have complained of finding worms and moths in their bag upon receiving it. — Added Omega-6 Fatty Acids! 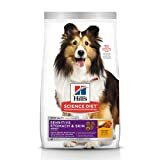 Hill’s Science Diet dry food is recommended by vets and is specially designed for dogs who suffer from sensitive stomach upsets and skin issues. Formulated for adult dogs, this complete blend offers rich nutrition packed with vitamins C and E and antioxidant benefits. The vitamins give your dog a rich, shiny coat and skin. It comes with high-quality protein and natural ingredients. The omega-6 fatty acids and essential vitamins also assist in promoting a healthy immune system. This blend is backed by vets as their #1 choice in dry blends in feeding their own pets. This unique formula is not limited to any dog size or breed type. Some of the high-quality ingredients that Hill’s Science incorporates into their foods are Vitamin E, Vitamin B12, D3 and C, oat fiber, apples, broccoli and much more, providing a well-rounded complete nutritious meal replacement. This premium dry food for dogs is easily digestible and promotes the nourishment of the skin. Dogs who normally do not accept new foods have no problem eating Hill’s Science food. One user gives much praise to this brand claiming her dog who suffers from extreme allergy symptoms was able to completely eradicate the condition after consumption of Hill’s Science. The taste seems to be well palatable according to most users, however, several buyers have complained of bouts of diarrhea in their pets after regular use. Diamond Naturals dry dog food is renowned for being a family-oriented business with the handling of operations completely ran by the family unit. Made in the United States, this real meat recipe offers high quantities of protein made from real pasture-raised beef and quinoa which promote strong healthy bones and muscles. 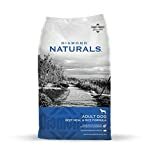 The vitamins, minerals, and proprietary probiotics packed into this dry food give Diamond Naturals a place in the market as a high-quality “superfood”. With a guaranteed 80,000,000 CFU per lb probiotic count and a blend of both insoluble and soluble fibers, this dog food offers optimum digestive support. Some added nutritional benefits include chia seeds, omega fatty acids, coconut, as well as flaxseed that aid in the development of shiny coats and healthy skin. One very satisfied buyer of Diamond Naturals complained that her dog was constantly licking his paws until they turned red. She had tried various methods and foods to no avail until Diamond Naturals was able to eradicate the condition. 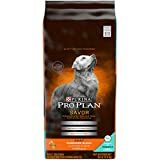 This brand has also helped some dogs replace some of their glucosamine and chondroitin supplements with this food as it already provides the essential minerals and nutrients. Just make sure you take note of how your dog reacts as some have been documented experiencing sickness and vomiting after consumption. Transitioning a dog to a new food must be done gradually. — Delicious Meat & Veggie Stews! Dog owners appreciate the fact that Rachael Ray’s wet food will never contain fillers, corn, soy, or wheat. Users give praise to Nutrish Natural as they personally feel Rachael Ray is a reputable, trusted brand. This wet food provides a high-quality source of nutrition for your dog’s health compared to other versions and brands. Though considering its brand reputation, one user claims that Blue Family Favorites is actually better qualified. — Not The Best, But a Cheap Wet Dog Food! For a pleasant change of pace, Cesar Gourmet Classics offers a wide variety of wet food of different flavors all packed together to give your dog some variety in his life. Just like humans, dogs also like a bit of variation in their day to day eating routine. With over 40 flavors to choose from, Cesar Classics ingeniously blends together the most essential dog ingredients into a soft pate to give your dog that extra kick in flavor and nutritional benefits. 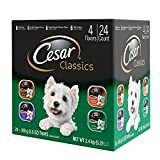 This classic, wet food comes at a very affordable price compared to other food brands, so if prices are a concern you can always opt for Cesar. However, you still get the benefits of certain vitamins such as A, B1, and D3. Each package contains 24 trays of pate with flavors ranging from duck, oven-roasted chicken, turkey, and grilled chicken. The trays are convenient, ready to eat, and come with freshness. Dogs tend to love the texture that meaty pates offer, which works as a great alternative to their ordinary dry food. You can either serve them the trays alone or mix it in their kibble. Users say that the Cesar Classics make great snacks for larger sized dogs. However, considering the price, it may not be the healthiest choice of dog food for your pet.